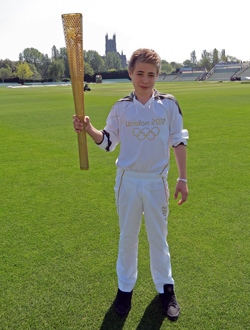 Torch bearer Andrew Evans-Fisher in front of Worcester Cathedral. The weather will be dry and warm with sunny spells as the Torch Relay makes its way to Worcester on Thursday. Temperatures could reach as high as 25 ºC as the sun breaks its way through the cloud. This week’s settled weather is good news for the Olympic torch’s journey from Maisemore to Worcester on Thursday. If you are planning to head out to follow the Olympic Torch then you can check one of our local forecasts available for locations along its route. In fact the Met Office provides local forecasts for over 5,000 locations across the UK. Forecasts for the Olympic Torch Relay are available on our website as well as on mobile phones and on our iPhone and Android Apps meaning you are never far from a local, detailed weather forecast. Forecasts for sporting venues at the Olympic and Paralympic Games will be available as the Games draw closer. The Met Office are providing weather forecasts to LOCOG as well as local and national government for the Torch Relay, Olympic and Paralympic Games to support event organisers, competing athletes and visitors and spectators alike. This entry was posted in Met Office News and tagged Met Office, olympic, olympic flame, Sun, torch, torch relay, weather, worcester. Bookmark the permalink. I’m going to the Olympic Torch event in Worcester tomorrow and I can’t wait…the weather is going to be amazing!